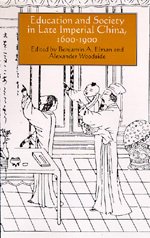 This comprehensive volume integrates the history of late imperial China with the history of education over three centuries, revealing the significance of education in Chinese social, political, and intellectual life. A collaboration between social and intellectual historians, these fifteen essays provide the most wide-ranging study in English on China's education in the centuries before the modern revolution. Benjamin A. Elman is Professor of History at the University of California, Los Angeles. Alexander Woodside is Professor of History at the University of British Columbia.